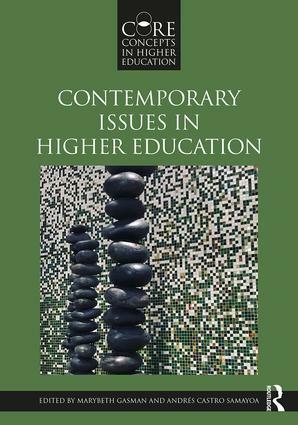 The latest text in the Core Concepts in Higher Education series, this volume speaks to the complex dimensions that higher education scholars and educators need to understand about the shifting role of postsecondary education in the United States. Chapter authors clarify current issues affecting the field, and offer fresh perspectives articulating how policy, demographic, and institutional changes influence the everyday practices of those who work in higher education. This book explores macro perspectives affecting institutional decision-making and processes as well as students’ perspectives on campus—from colleges’ credentialing procedures to the current demographic changes in students’ enrollments, to students’ social identities. Guiding questions at the end of each chapter offer readers an opportunity to frame discussions in which they can engage and invite readers to consider avenues for future research and exploration. This is a valuable resource for graduate students, administrators, and researchers who seek to understand and improve the policies and contexts of higher education today.